I smell her on me. Still. Wafting out while I try to bury her scent under tobacco and incense. I’m talking to my plant with my hands buried in the soil. We’re looking out the window together. We’re thirsty. Moistened, a fine film of mold starts to grow over us. She wants to see me. To wear to tomorrow’s party. Shhh… don’t wake the neighbors. We’re all smaller than our mothers. The ashtray is full. I’m going to bed. You can stay wherever you want. This ground doesn’t belong to me. Alright. I’m back. That whole sleep thing is harder than it looks. I’ve now resorted to listening to the Cocteau Twins. I haven’t listened to this album in a very long time and it’s bringing back memories. Fond, but sad memories. I’m hoping that sleep is associated with some of those memories. I just got out of the new batman movie, Dark Knight. Holy crap! Heath Ledger as the Joker was amazing. He made the entire movie. Not that this should surprise anyone. He’d been on a plane all day and she needed to get him clean. She put me in the bath with my underwear on. I had drawing pens in my pants. The ink mixed with the water and swirled in inky clouds – a pocket full of plastic squids. She came back to check on me. The squids’ black discharge upset her. She couldn’t clean it up, so she washed my mouth out with soap. My mouth wasn’t dirty. She was the one screaming. It didn’t bother me. I wrapped my head in bubbles from my mouth. Pop. Pop. Pop. Hippity. Hippity. Hop. I skip naked out of the bathroom. My smudged footprints gave me up. She found me in my cabinet fort. I should have known better than to trust the cleaning supplies to keep me hidden. It’s strange how smells bring back memories so strongly. Right now my apartment smells like it did when I first moved in, leaving a long relationship, living alone. Alone again now, I’m wondering whether the smell or the situation is doing the remembering. Stay awake. Don’t go to bed. Stay awake. Don’t nod your head. Stay awake. Don’t close your eyes. 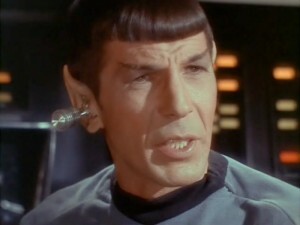 Not even Leonard Nimoy can make headsets look cool. But, if you’re going to wear one, at least have a spaceship.